Enter your email address below to email a temporary password. TraceCSO allows organizations to have visibility into and accountability for their risk and compliance profile. Unique to the market and requiring no third-party software, TraceCSO is a comprehensive, cloud-based solution that fully integrates and seamlessly guides users through the process of evaluating, creating, implementing, and managing a complete risk-based information security program. 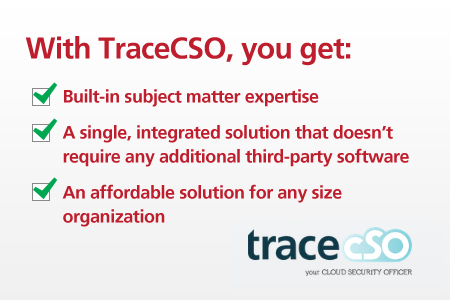 Developed by TraceSecurity, a pioneer in cloud-based security solutions, TraceCSO offers organizations, of any size and security skill set, the ability to protect its confidential information and meet regulatory requirements. TraceSecurity serves more than 1,400 organizations across financial services, healthcare, insurance, retail, government, education and other industries. For more information about TraceSecurity visit www.tracesecurity.com. To provide a product, to fulfill an order, or to complete a transaction. To ensure that our products are updated and operating correctly. To provide the appropriate level of support for our customers. In addition, we may use your information to improve the content of our website, products and services; to alert you to product upgrades and renewal information regarding your product or services; and to share special offers, product announcements and other new services from TraceSecurity. At the time you register, you will be given the opportunity to opt in or out. You may change your status at any time by contacting us via email, postal mail or fax. Please note that we do not allow our customers to opt out of contact that is required for the functionality of our products and services. We send service notifications via email to keep you informed about the status of your service orders or accounts and to provide updates and technical notices. These messages are essential to the maintenance of your subscription and the functionality of our services. Therefore, there is no opt-out available for service notifications and these messages cannot be blocked. We follow strict best practices for email marketing and customer contact. We may share the information you provide with our business partners acting on our behalf for the uses described above. TraceSecurity protects our customer data and access to customer information is restricted to authorized personnel only. Credit card numbers are used for payment processing and automatic renewals where applicable and are not retained for other purposes. Customers who wish to change or view their information should contact their sales representative, or contact us at the above address.